Debussy: Afternoon Of A Faun, a.o. ﻿»The flute of the faun brought new breath to the art of music.« With these words, the star conductor and composer Pierre Boulez stressed the immense importance of the impressionist key work "Prélude à l’après-midi d’un faune". Whether one regards the gentle, mysterious opening on the solo flute as a doorway to the avant-garde or simply as a musical representation of the lasciviously fantasising god of Nature Pan (faun) is neither here nor there. What remains fascinating is the passionate performance of the large orchestra, whom the composer refused to subject to angular cadences and bestowed it instead with continually shimmering, ethereal, well-nigh wistful harmony. The winds and horns perform with the greatest concentration, finely graded vis-à-vis the strings in the Nocturnes, which are divest of all symphonic form and display a wealth of veiled harmonies in elements which give the work form. 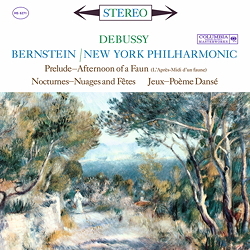 Culminating a very successful compositional repertoire, Bernstein and the New York Philharmonic present a fresh performance of Debussy’s final composition "Jeux". This vivacious dance is full of rhythmic arabesques that swirl around a central theme and round off the colourful depiction of Debussy’s free form quasi as a summary.